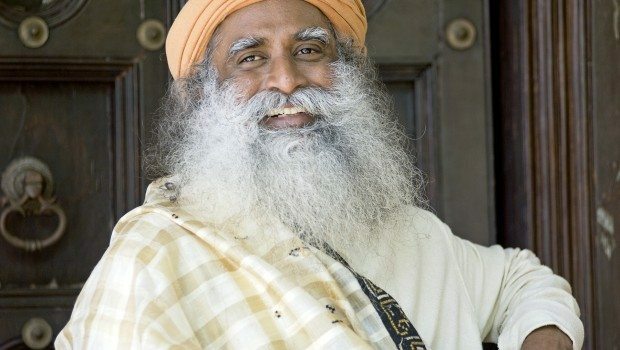 Sadhguru Vasudev, a yogi and thought leader who has addressed TED conferences, business forums and international audiences, as well as authoring more than 50 books, will bring his message of physical, mental, and inner wellbeing—Inner Engineering—to Atlanta, from April 19 to 21 in a conference at the Georgia International Convention Center. A free lecture, Inner Management: The Missing Link to Leadership Excellence, will be held at 5 p.m., April 14, at the Glenn Memorial Auditorium of Emory University, 1652 North Decatur Road NE, in Atlanta. This talk by Sadhguru is part of the prestigious Halle Institute of Global Learning 2013 Sheth Lecture Series. Register by April 12. One of India’s 50 most powerful people, Isha Foundation founder Sadhguru will give a free talk at the weekend conference on cultivating leadership as an innate and intuitive process—beyond strategies, techniques and 12-step programs. In a discussion that will benefit executives, entrepreneurs, academics and students, this mystic, yogi and humanitarian will talk about the importance of first managing your own mind, body and emotions before you can be an effective manager of external situations and people. Inner Engineering is a three-day immersion in the science and technology of inner health and well-being. Featuring guided meditations, asanas (simple yoga postures), powerful breathing and energy techniques and engaging discourse, the program offers practical wisdom and effective strategies for managing stress and bringing one’s entire system into alignment and harmony. Among the millions of people worldwide who have experienced Inner Engineering, the most commonly reported benefits are improved mental clarity and sleep quality, increased energy levels, the ability to better handle stressful situations, a greater sense of connectivity and joy in everyday life, and even relief from chronic diseases such as diabetes, migraines, hypertension, depression and more, as reported in a 2008 study conducted by the Indian Council of Medical Research. The program is presented by the nonprofit Isha Foundation, a non-religious, entirely volunteer-run, international organization dedicated to cultivating human potential and fostering peace and global understanding. The weekend program with Sadhguru also features music, exhibits and high pranic, or life-sustaining, nutritious and delicious foods for Saturday and Sunday lunches and Sunday breakfast. Based on tested, scientific principles, these programs offer tools for optimal health, emotional well-being and professional excellence. The simple postures, meditation and powerful methods of self-transformation do not require physical agility or any previous knowledge of yoga. Inner Engineering, the flagship program, is conducted regularly in major cities around the world and features a powerful process that purifies the system and allows one to explore higher dimensions of life. For details or to register, call 678-390-4742 or visit InnerEngineering.com/SadhguruLive. Numerous free local events are taking place prior to the Inner Engineering weekend. Follow updates at Facebook.com/IshaUSA.